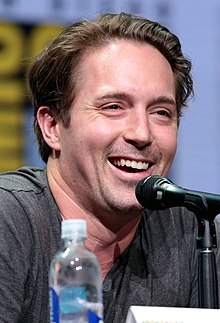 Christopher Beck Bennett (born October 1, 1984), professionally known as Beck Bennett, is an American actor, writer, and comedian who is a current cast member on Saturday Night Live, joining in 2013. Before his tenure on SNL, he was recognized for the AT&T "It's Not Complicated" commercials where he interviewed kids, his sketch videos with the comedy group Good Neighbor, and his YouTube show Theatre of Life. Bennett was born in Wilmette, Illinois (a suburb of Chicago), the son of Sarah and Andy Bennett. He performed in multiple shows at Children's Theatre of Winnetka. He graduated from New Trier High School in 2003 where he played Jean Valjean in his school's production of Les Misérables. Beck attended the USC School of Dramatic Arts in the B.F.A. Acting program. In 2003, Bennett joined the improv/sketch group Commedus Interruptus along with Kyle Mooney and Nick Rutherford. In 2007, after graduation, Mooney, Rutherford, and Bennett joined with editor/director Dave McCary to form the sketch group Good Neighbor. The group received praise from comedian Louis C.K. and director Steven Spielberg, who sent Mooney, Bennett, Rutherford, and McCary a personal acknowledgement after being impressed with the Hook parody, Unbelievable Dinner. He complimented the sketch and encouraged the group to continue making funny movies. In 2011, Bennett created the satirical political talk show Fresh Perspectives, which helped him land his AT&T commercials interviewing children. In 2012, he appeared in the film Kill Me Now, a film starring multiple internet sketch-comedy groups, and filmed Beside Still Waters by writer/director Chris Lowell. In March 2013, Bennett appeared in an episode of Last Man Standing, and that August voiced a character for FOX ADHD's Axe Cop. That same year Good Neighbor produced a pilot for Comedy Central with Adam McKay's Gary Sanchez production company, though it was not picked up as a series, in light of the move of three of the troupe's four members to New York City to star on Saturday Night Live. That same year Bennett completed work on the independent film Balls Out and appeared in season 4 of Arrested Development. Bennett voices Launchpad McQuack in the 2017 DuckTales reboot. Bennett debuted as a featured player on Saturday Night Live on September 28, 2013. He was promoted to repertory status for Saturday Night Live's 41st season in 2015. His celebrity impressions on SNL include Ashley Parker Angel, Javier Bardem, Bill Belichick, Joe Biden, Wolf Blitzer, Jeb Bush, Drew Carey, Bill Clinton, Harry Connick Jr., Simon Cowell, Bing Crosby, Ted Cruz, Guillermo Del Toro, Sam Elliott, Jim Gilmore, Roger Goodell, Mark Halperin, Philip Seymour Hoffman, Paul Hollywood, Matt Iseman, Ronny Jackson, Elton John, Brian Kilmeade, Steve Kroft, Howie Long, Al Michaels, Mitch McConnell, Jim Nantz, Kevin O'Leary, Nick Offerman, Mike Pence, Vladimir Putin, Jake Tapper, Malcolm Turnbull, and George Zimmer. 2013 Last Man Standing Police Sergeant (uncredited) Episode: "The Fight"
Arrested Development 'Straight' Straightbait Actor Episode: "A New Start"
Axe Cop Father of Boy (voice) Episode: "The Rabbit Who Broke All the Rules"
Lucas Bros. Moving Co Repo Man (voice) Episode: "DDT"
2015 Big Time in Hollywood, FL Ricky Episode: "Rehabilitation"
2017 Master of None Helicopter Pilot (voice) Episode: "Amarsi Un Po"
2019 The Other Two Jeff Episode: "Pilot"
^ "Here Are Your New 'SNL' Featured Players". Splitsider. 2013-08-23. Retrieved 2018-01-21. ^ Nudd, Tim (2013-04-15). "How AT&T Got Kids to Make Some of the Year's Best Ads". Adweek. Retrieved 2013-10-16. ^ Forde, Kevin. "The 8 Best Internet Sketch Troupes Whose Initials Aren't TAM". Cracked.com. Retrieved 2013-10-16. ^ Perkins, Colin (2010-10-05). "Sketch Artists: Good Neighbor Adds Some Absurdity to Viral Videos". Splitsider. Retrieved 2013-10-16. ^ "Good Neighbor Sketch Comedy". G4tv.com. 2008-12-19. Retrieved 2013-10-16. ^ beckbennett (2011-01-30). "More Theatre of Life". YouTube. Retrieved 2017-06-04. ^ "Children's Theatre of Winnetka". Children's Theatre of Winnetka. ^ a b c "Beck Bennett's calling answered with AT&T ads - Chicago Tribune". Articles.chicagotribune.com. 2013-01-30. Retrieved 2013-10-16. ^ "codythebeau comments on Louis C.K. reddit". Reddit.com. 2012-05-14. Retrieved 2013-10-16. ^ "Schubas". Schubas. 2012-01-06. Retrieved 2013-10-16. ^ Sykes, Tom (2013-04-09). "Beck Bennett: Meet That Guy in Those Adorable AT&T Commercials". The Daily Beast. Retrieved 2013-10-16. ^ McGlynn, Katla (2011-04-07). "'Fresh Perspective' On Libya Offered By Adorable Kids (VIDEO)". Huffingtonpost.com. Retrieved 2013-10-16. ^ Hampton, Adele (2012-03-30). "A seven-year-old's take on Mitt Romney's candidacy - The Hill's Video". Thehill.com. Retrieved 2013-10-16. ^ Friar, Christine (2011-07-01). "'Fresh Perspectives' Kids Talk Medicare, Call Paul Ryan A 'Lame Doo Doo' (VIDEO)". Huffingtonpost.com. Retrieved 2013-10-16. ^ Stuart Elliott (2013-07-02). "A Spokesman Finds Fame Interviewing Tiny Experts". The New York Times. Retrieved 2013-10-16. ^ "Kill Me Now: Internet Sketch Comics Make A Movie - Geekblog - Hex19 | Celebrating All Things Geek". Hex19. 2012-07-26. Retrieved 2013-10-16. ^ Jeff Sneider (2012-05-31). "Chris Lowell sets feature directorial debut". Variety. Retrieved 2013-10-16. ^ Frucci, Adam (2013-08-23). "Good Neighbor Is the New Lonely Island: 'SNL' Hires Director Dave McCary Alongside Two Cast Members". Splitsider. Retrieved 2013-10-16. ^ "Intramural: The Movie - 5 Questions w/ Beck Bennett". YouTube. 2013-08-01. Retrieved 2013-10-16. ^ Kurp, Josh (2013-05-08). "'Arrested Development' Season 4 Guest Star List". Uproxx.com. Retrieved 2013-10-16. ^ "DuckTales Reboot Teaser Confirms Summer 2017 Premiere Date". 7 December 2016. ^ "Tina Fey Introduces New 'SNL' Cast Members In Season 39 Premiere". Huffington Post. 2013-09-29. Retrieved 2018-01-21. ^ "'SNL' Promotes Beck Bennett and Sasheer Zamata to Repertory Players". Splitsider. 2015-10-05. Retrieved 2018-01-21. ^ "SNL Archives | Cast | Beck Bennett". snlarchives.net. Retrieved 2018-01-28. ^ "SNL Archives | Cast | Beck Bennett". snlarchives.net. Retrieved 2018-01-21. ^ "Instagram post by @beckbennett • May 13, 2016 at 12:17am UTC". Instagram. Retrieved 2018-01-28. ^ "SNL's Beck Bennett Marries Longtime Love Jessy Hodges". Us Weekly. 2018-08-26. Retrieved 2018-08-28. ^ "Student comedy group grabs attention | Daily Trojan". Daily Trojan. 2011-01-23. Retrieved 2018-01-21.